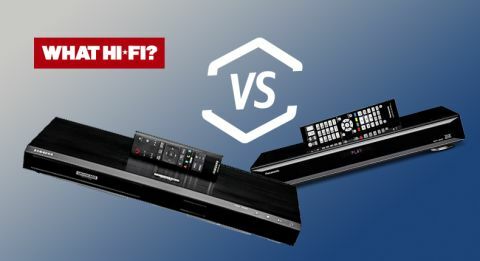 Panasonic UB900 vs Samsung K8500 – which is the best 4K Blu-ray player? hands on review | What Hi-Fi? The Chosen One will bring light to shadow and change our perception of reality, generally ushering in an age of clarity and enlightenment. So says the legend anyway. But it’s not really a legend. Ultra HD Blu-ray is a real thing. It genuinely can bring you 4K resolution, billions of colours and high dynamic range. We’ve been talking about the new format for so long that it had begun to feel like the stuff of fantasy. Then it arrived, swiftly followed by the first Ultra HD Blu-ray players. The time for theory is over. Now we must apply. Panasonic has the DMP-UB900, Samsung has the UBD-K8500, and we have them both. But which one is worthy? Which one will do your AV temple proud? The only way to find out is the time-honoured tradition of mortal combat. Welcome, Grasshopper, to the way of 4K Blu-ray. We’ve been here before. In our December 2006 issue, Panasonic took on Samsung with the first Blu-ray players. Panasonic won that particular duel, but now we have a rematch of sorts. This is Samsung’s chance for revenge. Before battle commences, let’s deal with the things they have in common. They are both UHD Blu-ray players capable of spinning 4K discs, both putting out a picture with a maximum resolution of 3840 x 2160, and in high dynamic range (HDR) to boot. They handle the Rec. 2020 (very wide) colour space, capable of reproducing colours not displayed on HDTVs (which use Rec. 709). Frame rates go up to 60p, and brightness has a claimed range between 1000 and 10,000nits, where one nit is roughly equivalent to one candle’s light. Sometimes this is helpfully labelled ‘HDCP 2.2’, but that’s not always the case. Get the wrong port and you may not get the full UHD Blu-ray offering. You will also need a high-speed HDMI cable. Given the hyperbole surrounding 4K Blu-ray, we were expecting the players to look a bit Space Age, but they wouldn’t look out of place next to regular Blu-ray players. That said, they hail from opposing schools of design-fu. Panasonic has gone for a shiny brushed-metal effect, with a mirrored front that’s actually a springy hide-all flap. It looks more luxurious than Samsung’s offering, which has a metal top but is let down by plastic elsewhere. Panasonic has gone for a classic slab shape, while Samsung’s casework is curved. Why? It’s something to do with all those curved TVs on the market in the last couple of years. Assuming you have one of those, Samsung would like your Blu-ray player to match. There are no performance benefits from a curved disc-spinner, it’s just an aesthetic thing. Our experience with oddly shaped boxes is that they look silly more quickly than those without visual quirks – there was a reason Sony stopped making geology-chic Blu-ray players inspired by crystals. Though design is a matter of preference, the Panasonic features a small display, whereas the Samsung only has a couple of LEDs. At this price, we might reasonably expect a display: time and loading status information is genuinely helpful, without it it’s hard to tell what the player is doing. If you’re going to lay down several hundred in cash, the DMP-UB900 looks closer to the part. So, Round One goes to Panasonic. But it’s what you do that matters, right? Both players have twin HDMI outputs. They also feature one USB port each, one digital optical output and one ethernet socket plus built-in wifi, meaning you can get online with apps such as Amazon and Netflix, which offer 4K streams. That’s it for the Samsung, but the Panasonic also has digital coaxial output, an SD card slot (SDXC compatible), and 7.1-channel analogue audio outputs. The remote controls are again a bit of a ying-yang situation. Samsung has gone for small size and simplicity, which means it is easy to hold and there are not too many options to confuse you. The downside to this is the density of the button layout, which will have you accidentally pressing the wrong thing, especially in the dark. Panasonic’s remote, meanwhile, goes for clarity and is much better. Its remote is big, with fat buttons, clear labelling and a sensible layout, which makes blind-clicking an easy task. As if that were not enough, there’s a backlight option too. Round Two goes to Panasonic. Its armoury is far better stocked. The first Blu-ray players took forever to load, leaving you plenty of time to go meditate or make a cup of tea. Thankfully, their descendents are much swifter. We insert several UHD Blu-rays – The Martian, The Amazing Spider-Man 2 and Mad Max: Fury Road – one after the other. On average, there is about 30-40 seconds between the disc trays clicking shut and the menu appearing, which is not bad at all. Blu-rays are a little faster, taking around 20 seconds. Navigation is speedy, too. We’re used to Blu-ray players being a chore to navigate, but there is little button lag here. The Panasonic and Samsung are also fairly evenly matched in speed. Both players have clear and easy menu systems. Panasonic goes for the minimalist approach, with lines of options, while Samsung goes for massive tiles to ensure you never get lost. The option for playing a 4K Blu-ray takes up a quarter of the screen. This one is down to personal preference. Round Three is an even match, but the Samsung did trip up a little. Our review sample had a couple of glitches involving the picture disappearing, or the machine crashing altogether. This was sorted out by restarting the machine, so we’d put it down to hiccups, rather than a full-blown personality issue. And now for the main event: the video quality. The combination of 4K and HDR represents a huge leap above the sort of image quality we’ve been accustomed to. What you get from both players is clearly better than Blu-ray. The colours are kicked up several notches, giving a more diverse and natural range of hues. The wider colour gamut makes for a more realistic, convincing picture. The HDR really makes a difference. You get brighter whites and darker blacks, with more degrees of separation in between. Bright areas – the sunlight glinting off the hood of a monster truck, for example – sparkle enough to make you squint. And yet, in the same frame, you notice a huge amount of shadow detail in the darker areas, like the dirt on the truck’s undercarriage. Detail levels are astounding, which is the entire point of 4K. Dirt, blood and sand are all rendered with the sort of sharpness and clarity that almost makes us feel we’re viewing the picture through magnified lenses. We go back to regular Blu-rays and find everything is noticeably reduced. It is all a little less clear. Textures are less defined. Contrast is weaker and colours are flatter. Now, a word on 3D. Though not officially included in Ultra HD Blu-ray specifications, both these players are compatible with 3D Blu-rays – so don’t throw your collection away just yet. That’s Ultra HD Blu-ray for you, but these two players handle them differently. The difference is not night and day, but the Panasonic still retains an edge. While the Samsung puts out a good amount of vibrancy in its hues, they are not as rich as on the Panasonic, which is also better at shading and providing a sense of depth. Both players make a compelling argument for 4K Blu-ray’s picture quality, but the Panasonic narrowly takes Round Four. It may have been a close match over picture quality, but sound quality is a different battleground. We play the opening scene of The Martian on UHD Blu-ray, where Kate Mara and Jessica Chastain talk about weather reports before heading outside to a sand storm, mixed in a DTS HD Master Audio soundtrack. The Panasonic is a fine-sounding device, consistent with our experience of the company’s Blu-ray players. What you get is a rich, weighty delivery. There’s a good sense of scale and no shortage of power. Sound effects are clearly and deliberately placed, and delivered with enough dynamism to grab your attention. If you want to be entertained, this will do nicely. Sadly for Samsung, it lags behind the Panasonic at every turn. Voices often have a hard edge to them, as do sound effects, which dynamically are a little flat. Meanwhile, the Panasonic’s sound is richer and fuller-bodied, with more subtlety and detail, making for a more substantial sound. The Samsung’s sound is also not as spacious as the Panasonic’s, nor as engaging. When Matt Damon is struck by a satellite, the impact doesn’t feel all that strong. With the Panasonic, you fear for his safety. Close your eyes and that flying grit is vicious enough to make you wince. Now that’s entertainment. The final, and potentially most important, round is the price. On paper, the Samsung has a distinct advantage – it costs £170 less than the Panasonic. But neither of them are budget Blu-ray players, and the Samsung makes sacrifices that we might expect to see further down the range. Take the awkward remote control, for example, or the lack of a display. The very point of UHD Blu-ray’s existence is to give you the ultimate home cinema experience, and with that in mind, the Panasonic certainly makes the most of your new 4K TV and justifies the difference. An extra £170 buys you a nicer looking machine, with a more mature finish and more connectivity options. Its user experience is superior, as is the handling of picture and sound. It is not easy being the first of a new breed. Not only do you need to perform well, you have to do so with the distinction required to promote a new format. We were worried about format teething issues, but even at this early stage, both players are perfectly capable of extolling the virtues of 4K on disc. As far as we’re concerned, it’s mission accomplished for Panasonic and Samsung – they’ve both come a long way from the three- and two-star reviews from 2006. However, this Panasonic Ultra HD Blu-ray player has emerged as the clear winner, proving to be far more than just proficient. It has delivered a devastating first blow and issued a challenge to all who dare. Even with the price difference, we would whole-heartedly recommend the Panasonic DMP-UB900 over the Samsung UBD-K8500. If you’re searching for home cinema enlightenment, this is as close as you’ll get right now.